In Turkey, camel wrestling is one of the most ancient traditional performances and, despite being rooted in the past, every year gains more and more popularity among tourists. Although Ataturk, along with other founders of the Turkish Republic, show rejection for such an activity already back in 1923, his portrait presides over the arenas where those shows are performed and which are funded by the government. 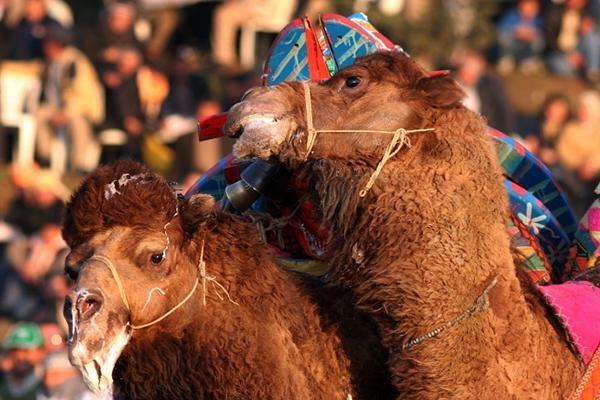 Every January, more than 20.000 people from different nationalities would watch the “Selcuk Efes Camel Wrestling Festival”, an event which was first started in 1982 by the Turkish Minister of Culture and Tourism himself. Although this is the most popular festival, all along the year and in different parts of the country several others take place. This performance, which is highly criticized by animal rights organisations from all over the world, requires 140 participating camels specifically raised to fight – male camels and female dromedaries are crossbred in order to increase sizes and strength – and divided into different categories according to their weight and age. To ensure “ferocity” in the participating ruminants – usually calm and placid – the fight season occurs during the three months of fertility of female camels and, as a consequence, when the males are more aggressive. Even before starting, it is usual to see camels drooling because of stress. Moreover, they are forced to keep a fast or to starve during months prior to the event, so that they get easily irritated. The animals fight employing different “techniques”, typically using their necks as weapons. Very often, trainers “push” animals to fight by putting pressure or beating them with sticks. Camels try to bend and keep their rival’s head to the ground by means of their neck and, occasionally, they jump on it. Also, they jostled with each other, trying to trip, by placing their neck between their rival’s legs to make him sit on the ground. The animal that does not get scared, run away, shout or fall to the ground wins and he is usually sold for a high amount of money. Those in charge of the event claim that it is not a cruel performance as camels’ mouths are covered, to avoid biting, and referees stop the fight in case it becomes too violent. On the contrary, according to the local NGOs, those performances are illegal since they break local laws on animal defense. In addition, they state that tradition must not be an excuse to mistreat other beings.